Five Ten Burger owner Roland Robles serves organic burgers, local ingredients, and made fresh on the spot burgers and sandwiches. You won't see any steam tables inside this truck's kitchen. Roland Robles is a proud East Bay native. He has been cooking in restaurants for over 25 years and when it came time to open his own food truck, it wasn't hard to come up with a name. Fiveten Burger was born last August. But it took months of planning and years of perfecting his art to get there. The Oakland-based food truck now has a loyal following and makes stops in Berkeley, Emeryville, San Francisco and Oakland. It's the care that Robles takes to perfect his craft that resonates with customers. "Our food has a relationship with Oakland," he said Wednesday while serving dinner in front of Acme Bar in Berkeley. By that he means his burgers are made with local ingredients and he prefers grass-fed beef. Meat for the burgers comes from the Golden Gate Meat Company and Eel River Ranch. It's organic to please even the most finicky Bay Area hippie. Robles jokes that while his food truck isn't Burger King, his customers still get it their way. To do that he pays extra special attention to the little things. Robel makes his own pickles in small batches and he worked tirelessly with a local bakery to get the buns he serves with his burgers just right. When he renovated his truck, which he spent about a year fixing up before he opened, he removed the steam plates from the mobile kitchen because he wanted all the food to be prepared fresh. Wednesday he had the capacity to make 150 burgers and within an hour of opening his service at 5 p.m. he was out of cow sandwiches. 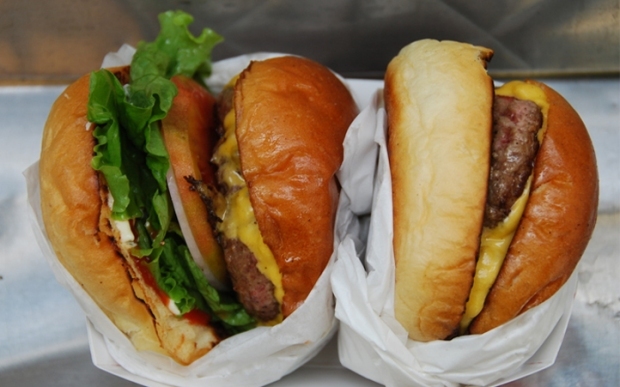 Like most mobile food services in the Bay Area, Fiveten burger is all over Facebook and Twitter. "If it wasn't for (Twitter and Facebook) this business wouldn't work," he said. The work has paid off. Business has been good for Robles, who says the popularity of his truck grew after he attended the Eat Real Festival in Oakland last year. "The more supplies I order, and the less hours of sleep I'm getting, I know we're busier," he said. And that's just fine with a chef who quit a quarter century in the industry to be his own boss -- even if he does serve burgers "your way." Find Fiveten Burger on the web for a full menu and a list of where you can find them.